When water finds its way into concrete surfaces, it can rust the reinforcing rebar in the concrete. As the rebar continues to rust, it expands causing the concrete to "spall". A spall is where layers of concrete have broken free of the remaining sound concrete. These spalls can lead to structural problems and water entry points. They also create safety issues for pedestrians and traffic that use the concrete surface, or find themselves below these surfaces. Building movement can lead to structural cracks in concrete surfaces. 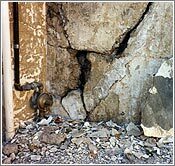 Structural cracks not only allow water to penetrate a building, which can lead to spalling, but they can also lead to further structural damage and jeopardize the integrity of the building. Solidarity Painting employs a variety of techniques to solve these problems before they occur and during a remedial repair. Some of these solutions include chemical grout injection, epoxy injections, spall removal and repair, sealant replacement, and elastromeric wall systems. Solidarity often applies elastromeric coating as part of a complete waterproofing program. Structures benefit from a finish that is cosmetic, but also durable and flexible enough to act as a moisture barrier. Proactive waterproofing can prevent damage caused by water. Remedial waterproofing can correct damages and prolong the life of the structure, making it safe once again.